Once again, this episode kicks off with a story already in progress, but we quickly learn that it is an incomplete tale and the Midnight Society decides to start off. Finally, David comes forward with a tale. But what's odd is that Kristen makes the comment that David hasn't told a story in awhile. But we know this to be incorrect -- he told the story last week (this is most likely due to the fact that the episodes are aired in a different order than they're filmed. AYAOTD? 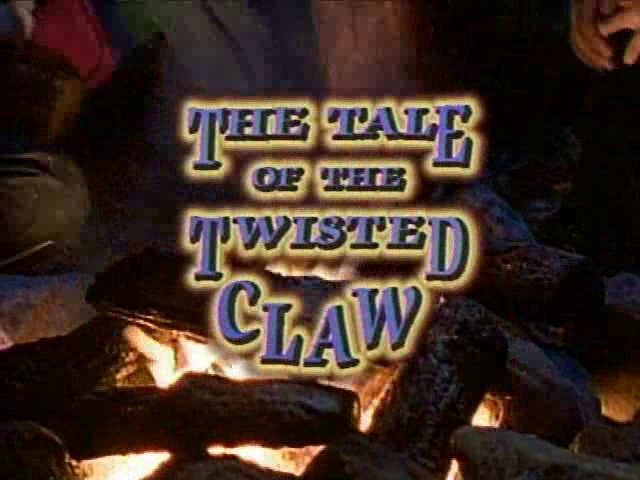 -- S01E04 -- "The Tale of the Twisted Claw"
The tale kicks off on the night before Halloween, or "Mischief Night" as they call it (but THE CROW taught us that it's "Devil's Night"). On Mischief Night, a large majority of the kids in town roam the street, egging houses and TP'ing trees. 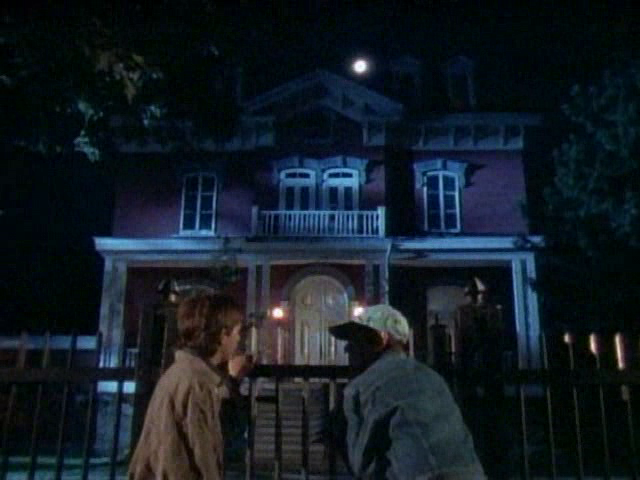 Alas, two boys, Kevin and Dougie, stop outside the neighborhood's spook house, daring one another to go knock on the door. The witch's house, as they call it. Kevin and Dougie finally muster enough courage to make it through the yard and up to the door of the house. Their plan is to spray shaving cream all over the front door. But just as they're about to spray, the door opens and they cream the old lady's face. She flails backwards, knocking a vase over and smashing it. They boys run away. 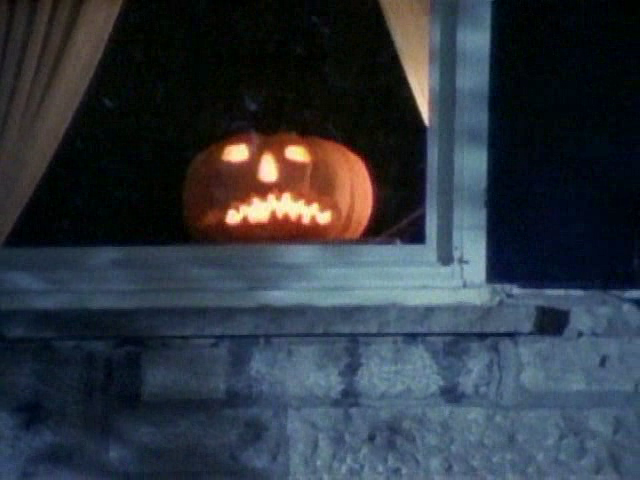 The old lady comes out to the porch and laughs maniacally. 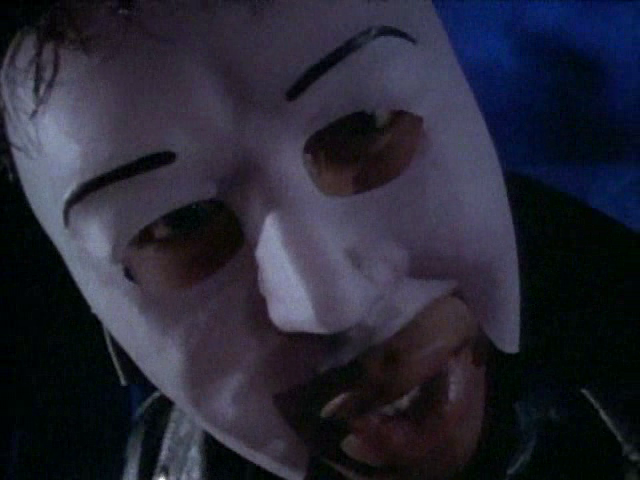 And then it cuts to a scene of Dougie popping up in a super-creepy Halloween mask. 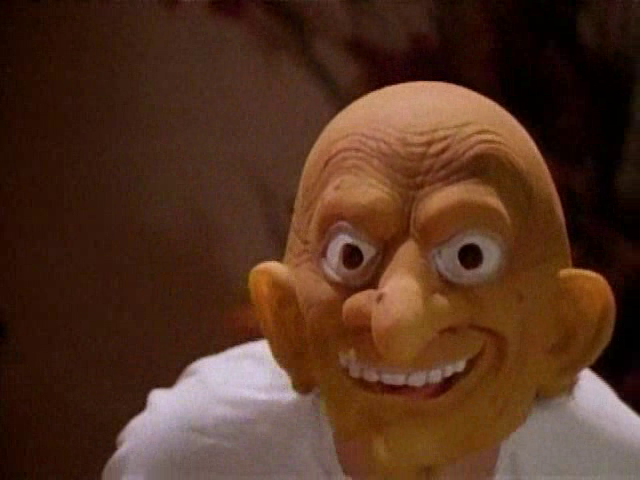 In fact, I believe I had a cousin who used to own this exact mask. He then proceeds to fake a long and agonizing death while his father reads the paper in the chair next to him. The doorbell rings and it's his friend Kevin, dressed as a bum for the umpteenth Halloween in a row (a clear homage to E.T.). The two head out. The two eventually make their way to the witch's house. And after a short conversation on how they can be the first two kids to ever go up to the door and trick-or-treat, they do just that. The door creaks open and the old lady peers through. She doesn't know what "trick-or-treat" means. She invites the boys in. She tells them that since they're first two kids to ever come to the door that she'll give them something special. 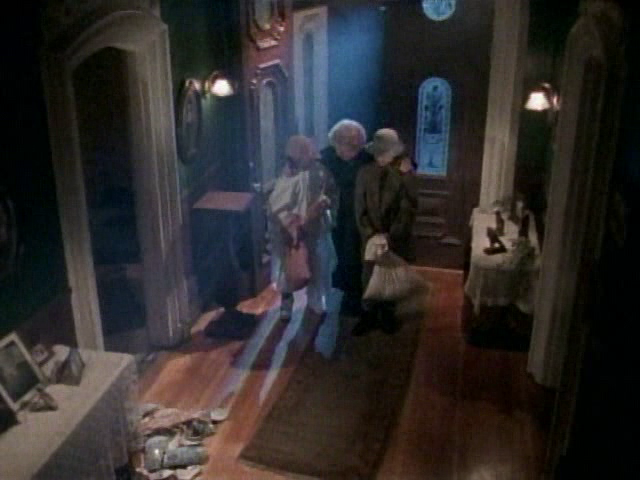 She leaves to retrieve the special gift as the boys notice that the broken vase is still lying in a pile on the floor. ...with the claw of a vulture! She proceeds to tell them that it isn't real and that it's only made of wood. And that it is also charmed and that whoever has it will be granted three wishes. Kevin and Dougie accept that gift and head home. On the way, Dougie makes the off-the-cuff comment that he wishes he could go home and the claw jumps out of the box onto the ground. They shake it off and keep on. They run into the some rough-looking people (also slightly resembling the bad guys from THE PURGE and THE STRANGERS). 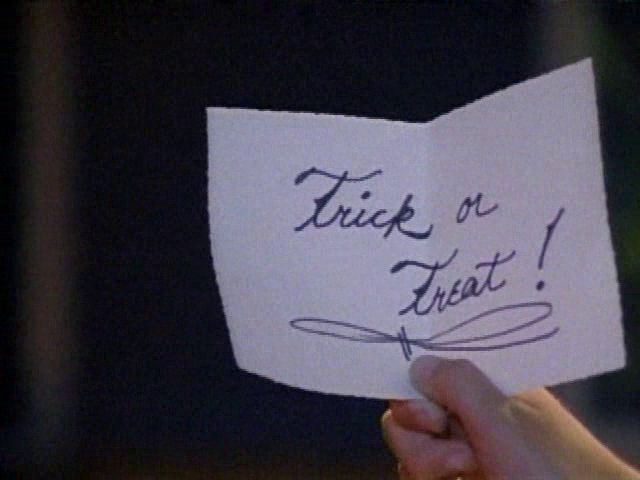 The punks gave Dougie his wish -- no more trick-or-treats. The next day at school, Kevin makes the wish that he could be another kicked named Bostick in the 600 meter dash. And he does just that, but not until after a vicious dog runs out of nowhere and knocks Bostick to the ground. Later that night, at Dougie's house, him and Kevin are sitting in the living room, arguing over whether or not to come clean about everything. Dougie keeps insisting that he tell his folks and finally Kevin has had enough. 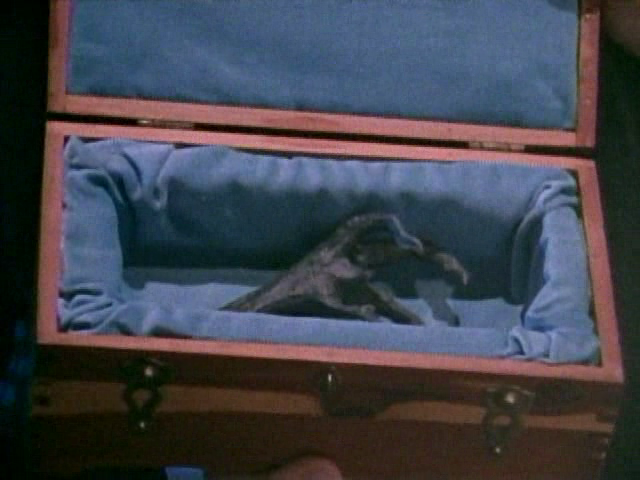 He snatches the claw from Dougie and says, "I wish you'd lose your folks." Though it was an accident, the consequences are quite real. The phone rings. It's the police informing Dougie that his parents have been in an accident. Dougie, panicked, wishes that his grandfather was here, he'd know what to do. Kevin looks over to Dougie and says, "Your grandpa's dead." Suddenly, they hear a car pull up. It's Dougie's grandfather's old car. Uh-oh. The two wrestle for the claw, each wanting to make the wish that'll end the horror. Finally, Dougie gets control of the claw and wishes that they'd never broken the witch's vase and that they're very sorry. The claw disappears in his hands. The doorbell rings. They hesitantly answer. It's Dougie's parents, alive and well. The doorbell rings again. They answer. No one's there. But they look down and see the vase, fully intact...with a note attached. It was the witch who would have the last laugh. The Midnight Society approves of the impromptu story. Next episode: S01E05 -- "The Tale of the Hungry Hounds"